You are here: Home » What’s for dinner? So now that I’ve started this nifty little project, I already feel the pressure to come up with creative, easy, healthy recipes. Let it be known that sometimes my recipes will be half assed and some I won’t even post at all because they’re not going to be blog worthy. 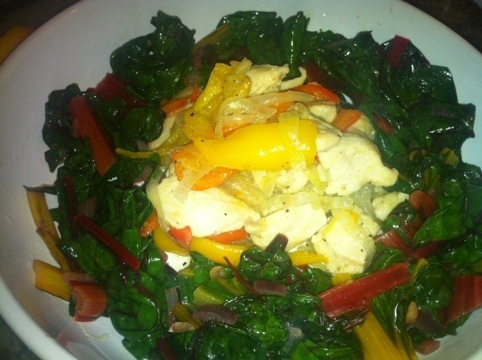 If you haven’t tried swiss chard, you are missing out!! It’s one of nature’s super foods! This leafy nutritious veggie is packed with tons of polyphenol antioxidants and Vitamins A, K, C. It’s one of the best leafy veggies you can eat. Try it out! I should preface these “low carb” recipes with mentioning that I’m really not a proponent of fad diets. They might work in the short term, but you can’t live your life this way and eventually the weight piles back on. Let me remind you that my cruise is now less than 2 weeks away (yes, you should be jealous) and it’s crunch time for me…literally. Soooooo, yes. I’m buying into the whole low carb, low fat fad until my cruise where I will probably undo all the hard work in 5 days while I stuff my face with free food on the cruise. Oh well–c’est la vie! Heat up a couple of teaspoons of olive oil in a pan and toss in your garlic and onion until the onion starts to “sweat” and becomes opaque–about 3-5 minutes. 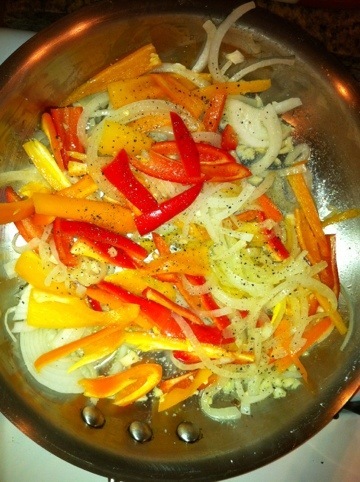 Slice the top off your mini peppers and slice them lengthwise into thin strips, almost julienned. Throw them in the pan and maybe just a touch of water and cover the pan so they can start cooking. 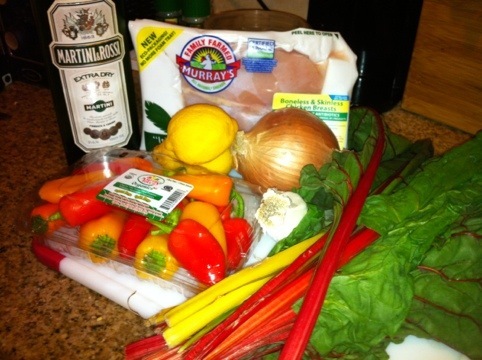 Cut the chicken into strips and then small pieces. Once your peppers are a little softer, throw in the cubes of chicken. Season with salt and pepper. Don’t overcook the chicken! In a large saute’ pan heat a couple of teaspoons of olive oil, about 1-2 tablespoons of butter and half of a chopped red onion. While the onion is cooking, cut the stems off of the chard and chop them into about 1 inch pieces. Throw them into the pan and let them cook for about 5 minutes. The stems take longer to cook than the leafy part so this is why we’re going to put them in the pan first. Pour in your white wine/vermouth. Let this all simmer. Coarsely chop the leafy portion of the chard. Once your stems have softened a bit (just try one), toss in the leaves and keep turning them with a pair of tongs. You’ll see that they wilt rather quickly and what looks like a whole lots of leaves turns into a pretty small portion! Season with salt and pepper and dress with fresh lemon juice to taste. Wish I were this healthy all the time!!! Self confessed Glutton too 😀 but het, only if the calories are worth it! 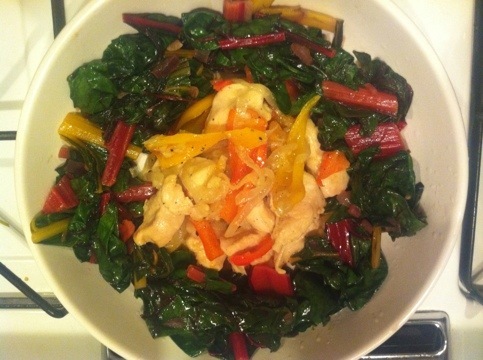 Hi Melissa…have never wanted to try swiss chard but you have convinced me with your recipe! Thank you!